Mae West: "Too Much of a Good Thing is Wonderful"
For many, Mae West is memorable only for her screen roles, particularly Lady Lou in She Done Him Wrong and Tira in I'm No Angel, both from 1933 and both co-starring Cary Grant. In the first of these films, West asks Grant, "Why don't you come up some time and see me?" In the second, she changes the line: "Come up and see me some time." But West not only starred in these films (and a few others before the enforcement of the Hays Code made her blatantly sexual persona disappear from the screen), she created them. 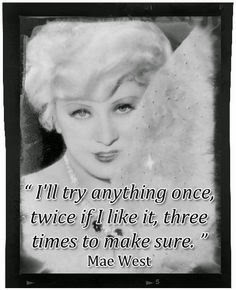 Long before Hollywood, she not only performed her greatest role--Mae West--she wrote and produced her own plays, and most of her films were based on her own scripts. I've been rich and I've been poor. Believe me, rich is better. I like my clothes to be tight enough to show I'm a woman, but loose enough to show I'm a lady. Don't keep a man guessing too long -- he's sure to find the answer somewhere else. So many men . . . so little time. I only have "yes" men around me. Who needs "no" men? Save a boyfriend for a rainy day--and another, in case it doesn't rain. Some men are all right in their place--if they only knew the right places! I like a man who's good, but not too good--for the good die young, and I hate a dead one. Men? Sure, I've known lots of them. But I never found one I liked well enough to marry. Besides, I've always been busy with my work. Marriage is a career in itself and to make a success of it you've got to keep working at it. So until I can give the proper amount of time to marriage, I'll stay single. Don't marry a man to reform him--that's what reform schools are for. Too many girls follow the line of least resistance--but a good line is hard to resist. Good women are no fun. The only good woman I can recall in history was Betsy Ross. And all she ever made was a flag. You can do what you want, but saving love doesn't bring any interest. Any time you got nothing to do and lots of time to do it, come on up. Kiss and make up--but too much makeup has ruined many a kiss. Cultivate your curves--they may be dangerous but they won't be avoided. And, one of my favorites, since I've already posted on Catherine the Great. 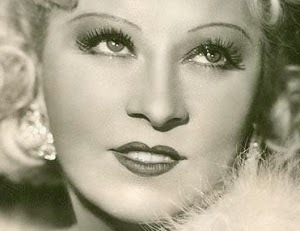 Here's Mae West from a speech she delivered during a curtain call after she performed her play Catherine Was Great: "She ruled thirty million people and had three thousand lovers. I do the best I can in two hours." There are many wonderful biographies in addition to the films--and many websites. Unfortunately, the links to these websites are changing all the time, and I can't keep up with "fixing" all the broken links. So if you want to start reading online, I suggest the TCM "overview" of Mae West--click here.